Click to choose a Size: -- Choose Size -- Black Aluminum Frame - 24" x 36" Black Plastic Frame - 24" x 36" Black Poster Hanger - 24" Clear / Transparent Poster Hanger - 24" Metallic Anthracite Plastic Frame - 24" x 36" Metallic Blue Plastic Frame - 24" x 36" Red Plastic Frame - 24" x 36" Silver Aluminum Frame - 24" x 36"
Each frame has sawtooth hangers on the back, vertically and horizontally, which makes hanging the frame very simple. We state the actual poster size separately from the frame size to indicate whether there will be a border around the poster or not. For example: If the Poster size states 22" x 34" and the frame size states 24" x 36", then there will be a 1" white border around the poster. If a poster is listed at size 24" x 36", then there will be no border around the poster. 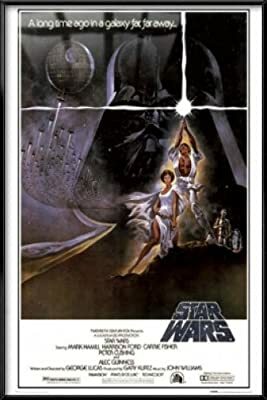 Since these frames come pre-assembled in fixed sizes, and sometimes the size of the actual poster varies, it may happen in rare cases that a poster does show a white border around it even though it was listed as the same size as the frame. We do apologize, should that happen. ATTENTION: Frames can ship to the lower 48 contiguous states ONLY. They can also NOT be sent to PO Boxes. Express or Expedited shipping is NOT available on frames or framed items. All frames are shipped Fed Ex Ground. All frames and framed items ship in heavy duty custom made cardboard boxes. If you have any questions or concerns about a framed poster you would like to purchase, please contact us via email.